On September 11th, we decided to trade Tesla (TSLA). 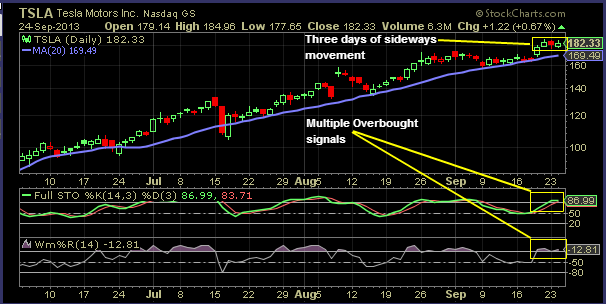 We had been watching the trajectory of this stock since August 1st, when it was trading at $135.00. 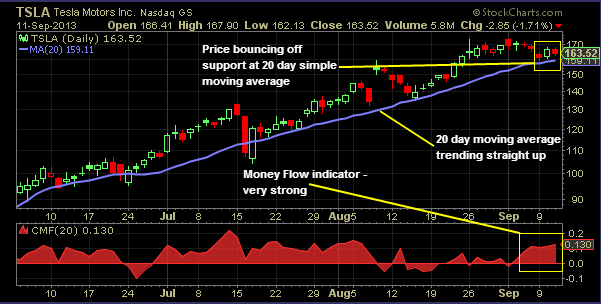 We felt the price action warranted a closer look. This stock had been the definition of volatility, where any news caused big price swings, whether warranted or not. From Department of Energy loan repayment issues to the ongoing battery supply saga, Tesla’s stock has never been short on headlines. By September 11th, we had seen enough and knew that it was time to go long. We then watched TSLA do exactly what we had predicted, go up for apparently no significant fundamental changes. It was a typical herd mentality, along with a good amount of short-covering. But we weren’t complaining as we saw the price rise from $164 to $183. At this time, we were also getting the feeling that TSLA was becoming the APPL of the car industry. It was becoming apparent to us that buyers of the cars were not price-sensitive consumers but rather those that wanted to make a statement. Those are dream consumers for a company because they almost take pride in the fact that they overpaid for a product. We had seen enough and took our $15 profit in 9 days and closed out the trade. What happens next with TSLA is anybody’s guess but we’re certainly going to be watching it because this is the type of stock that presents wonderful trading opportunities for those that know what they are doing. Trust the charts!